My toddler rarely plays with toys, except when those toys are brand new. He is quickly bored, and shows very little interest in his basket of toys. He’d rather empty cabinets, steal his big siblings toys (with tiny pieces of course), or play with regular household items (the broom, bowls and spoons, remotes, etc). 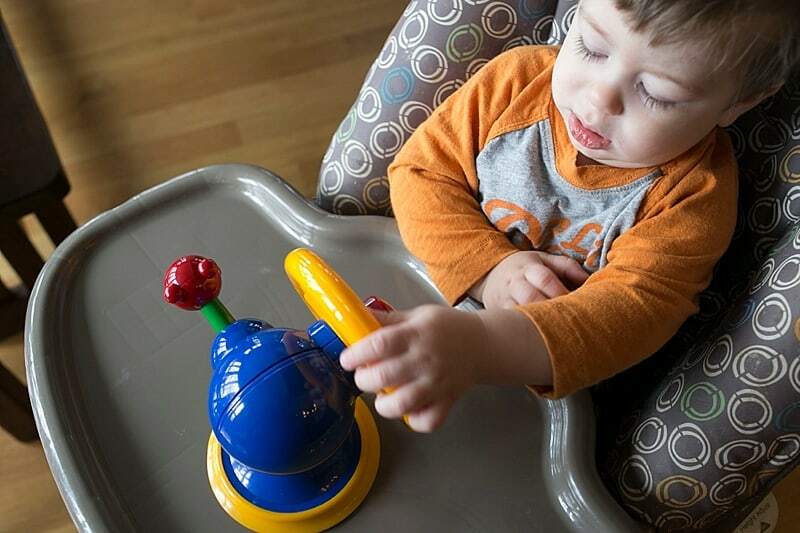 With SPARKBOX TOYS, Jonathan can receive four new toys every month to play with. When he outgrows or tires of them, I just mail them back. No more unloved toys gathering dust, taking up space on shelves, or being strewn all around the house! For a monthly fee, you receive a box of toys shipped directly to your home…and when you’re done, you simply return them with free shipping. The experts at SPARKBOX TOYS choose developmentally appropriate toys based on the age of your child and information you give them. Choose to receive a SPARKBOX once every 4 weeks for $34.99 a month, or every 8 weeks for $19.99 month. (Pay for a whole year of toys for a discounted rate.) Shipping to you and back to SPARKBOX is included in the fee. You can cancel anytime, and there are never any late fees! All of the SPARKBOX toys go through a 5-step cleaning process that includes surface cleaning, sterilization, disinfecting, inspection and vacuum sealing before being packaged for your family. 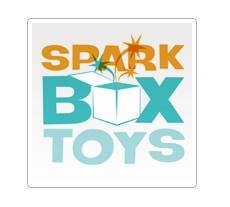 Once SPARKBOX arrives enjoy playing with the four toys until your child outgrows them or simply tires of them. There are no late fees, so keep each toy as long as your child loves it. In fact, if you want to keep a toy forever just buy it from SPARKBOX for a discounted price. 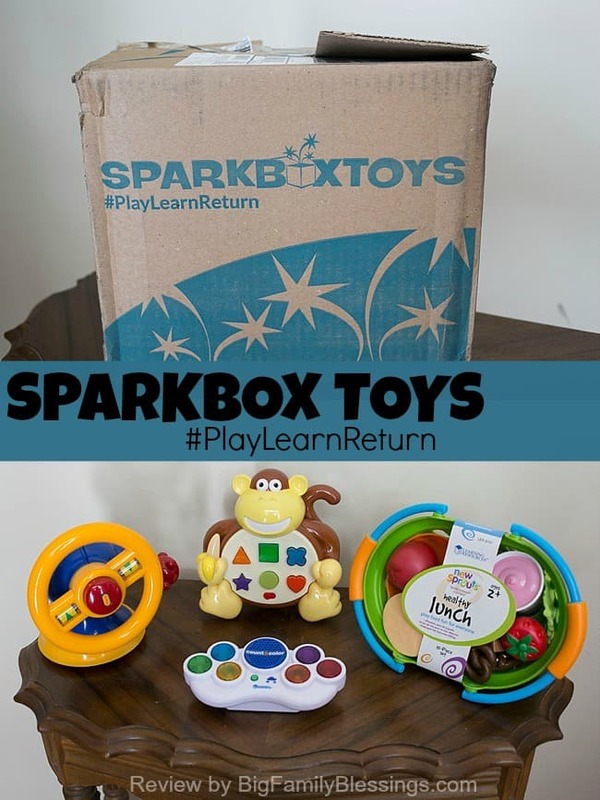 I asked the experts at SPARKBOX for toys appropriate for a 15 month old boy and a 3-year-old girl. Our box arrived with two toys appropriate for each of my two children. I am really impressed with the SPARKBOX choices for my children. In fact, I’d really like separate SPARKBOX subscriptions for each child! SPARKBOX could not have arrived at a better time for my kids. With the medical issues of the last month, the distraction of new toys was so nice. I loved this suction cup wheel toy for my 15 month old. It kept him happy in his high chair many afternoons while I prepped dinner! He also loved this light up monkey toy. With multiple long car trips this month, it was perfect for keeping him occupied in the car. 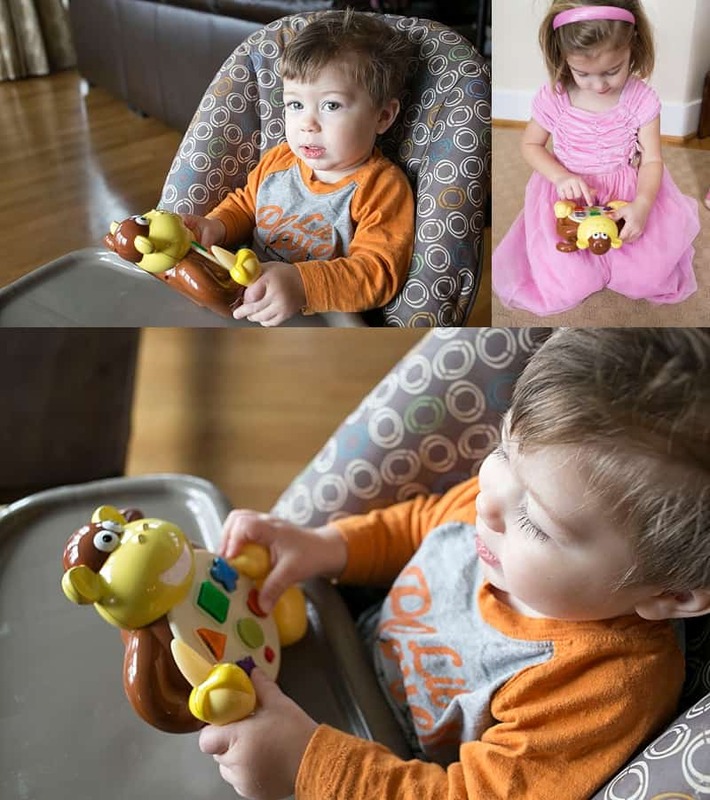 My three-year-old also loved the monkey. She was so proud to demonstrate her knowledge of shapes and colors with him! This Count & Color electronic flashcard game was a hit for the entire household! It reminded me of the Classic Simon Says light up game I played as a child. Even the adults in our home passed it around to see who could play the game the longest with no mistake. This was another toy I was grateful for during our many long car rides this month! The biggest hit in our SPARKBOX was a picnic basket full of food. Both my 3- and 5-year olds love it. I think this toy will have to stay here for good! I’m so glad SPARKBOX allows me to buy any toy that is a true hit with my kids! I must say, that when I first saw a toy that must be returned with so many small pieces I panicked. Surely we wouldn’t be able to keep up with the pieces! But smart SPARKBOX sent this cool mesh bag to help keep the pieces together. Plus, I found out that SPARKBOX is really great about missing pieces, you can wait as long as needed to return the toy until the pieces all show up, or even pay a small fee for just the missing pieces if you determine that the part is lost for good. 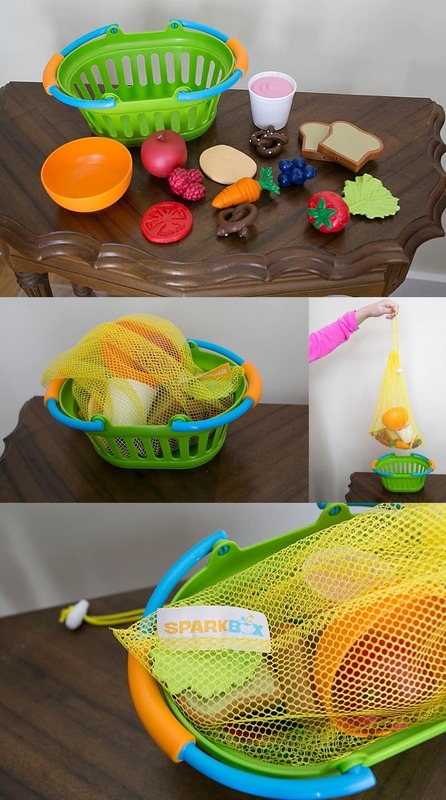 Definitely go check out SPARKBOX for a great way to entertain your children without cluttering up your home with toys! I love this idea. 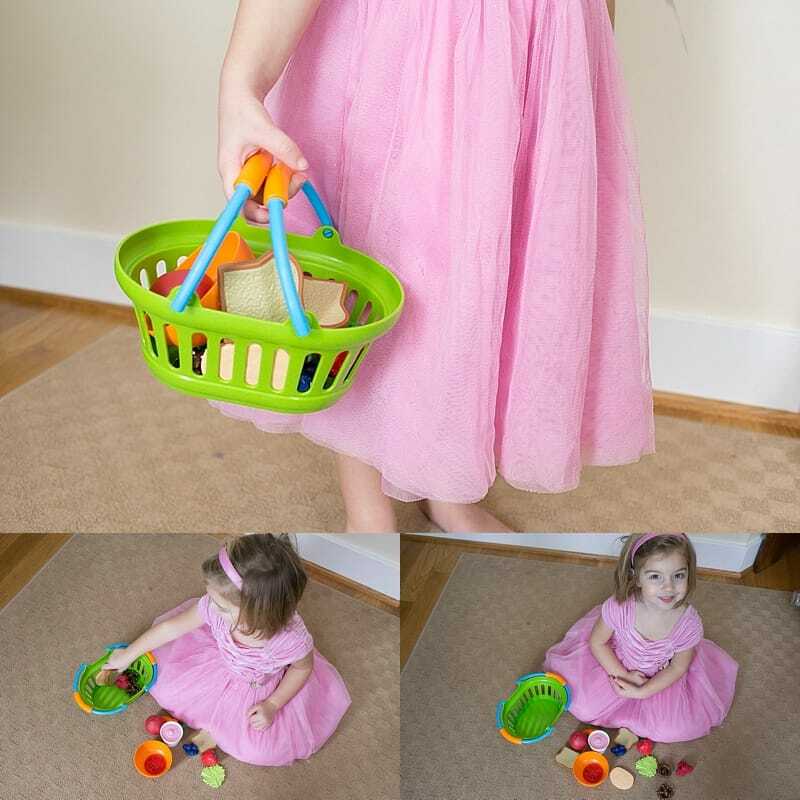 My kids get sick of their toys, especially baby toys, this is genius! !